Microgaming takes us on a journey to see some of the greatest animals in North America with White Buffalo video slot game. A snowy wonderland inhabited with one of the most sacred animal, the White Buffalo. The game itself portrays the real America where everything needs to be big, massive and powerful. A snow covered landscape and leafless trees can be seen in the background which implicates that the slot is nature themed, a remarkable piece of art that pleases the eye. There are 2 special symbols in White Buffalo, the wild symbol and the scatter. A circular talisman is the wild and its function is to substitute for all the other symbols, except for the scatter, to complete a winning combination. White Buffalo is the scatter but it does not activate the free spins in this game. It only offers scatter payouts. So we are left wondering what activates the free spins. The answer is quite simple though, the free spins are activated randomly, so you do not have to look at the pay lines and waiting for the third symbol to land. The best part, when it comes to free spins is that once you activate them you receive 6 free spins and all the animals turn into White Buffalos. At times, activating the feature can be really life changing experience. What is more, the free spins can be re-triggered too. 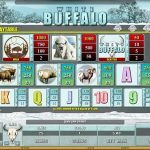 Microgaming never ceases to amaze us when it comes to online slots, and White Buffalo is not an exception to that rule. The game seems very powerful and luring, so you have to try it. The true natural beauty is captured through impeccable graphic design in this entertaining video slot game. The next one is one of the best themed slots we like! Witches Wealth a 5 reel slot by MicroGaming.